David Shetterly didn't think much of The Rocky Horror Picture Show at first. His best friend bought the 15th Anniversary VHS when it was released, and he couldn't understand why someone would pay almost $90 for a videocassette. A few years later, he watched the 1993 RHPS Fox TV special, and didn't find Rocky Horror to be anything great. In 1994, as a senior in high school, David found that the people in his world were filled with prejudice, intolerance, and a general lack of comprehension of anything or anyone different from themselves. He was very much an introvert, and he wore a trench coat and had long hair - something that, if he were in high school today, "would have school administrators unjustly worried". David quietly graduated from high school, and looking back at that time, says he "didn't have too much to look forward to". A few months later, on Halloween '94, another friend decided to bring him to see the local Rocky Horror cast, Inside Insanity, in Nyack, NY. When he got to the show, he didn't know what to expect. What he found, though, was amazing. RHPS, in a theater, on Halloween, is for lack of a better word, pandemonium. People are dressed up, in makeup, in drag, in their underwear, being who they want to be and doing what they want to do... a cast of outcasts. And within this merry group of freaks, David finally found a place he could call home. He didn't go to another show for a few months, and when he finally went back, yet another friend of his thought it would be fun to dress him in drag. He reluctantly agreed, but felt odd about it. Being at the show, though, was an entirely different story. So many people were so open and accepting of how he dressed, and since David enjoyed it too, it soon became a regular occurrence for him. As a result of going to Rocky Horror, he began to become more extoverted, and learn more about who he was. 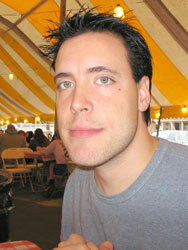 Eventually, David joined the Inside Insanity cast, playing the Criminologist as well as running the cast website. And it didn't stop there. Every week, he would drive 50 miles to watch the Edison, NJ show on Friday nights, come back home, and do the Nyack show on Saturday nights! Eventually, Nyack's Cinema East closed in 1996 to become a performing arts center. The cast moved to a new home in nearby Pearl River, NY, and David moved with it. In 1997, he moved to New Jersey with his girlfriend, and soon their time and energy were devoted to a new cast. Together they were cast directors of Little Morals, a Friday night cast that started at Cinema 35 in Paramus, NJ and soon moved to the Cedar Lane Cinemas in Teaneck, NJ. Sadly, the Friday cast did not get as large an audience as its Saturday counterpart, so when Little Morals was no more, the members joined the Saturday night cast. During most of those nights, David usually played Frank-N-Furter, but there were some odd nights, including the one where he put on a piece of everyone's costume, gave the cast the night off, and performed the entire show by himself! Eventually there got to be a lot of drama in the cast, many cast arguments, and a few cast takeovers. As David was feeling more and more "burned out" by the situation, he started to focus his attention away from being in a cast, and more towards other projects that he thought might help the Rocky Horror community as a whole. One of these projects came from fan complaints about the 1990 stereo sound mix found on the VHS tape and (at the time) all subsequent releases. The 1995 LaserDisc was supposed to have the original mono track as an alternative, but did not. In 1999, David decided to start his own website with a petition entitled Fix The Sound!. He still doesn't know to this day if his petition actually made a difference, but either way, his goal was acheived when the 2000 DVD was released (which has a remixed, more accurate 5.1-channel audio track AND the original mono audio track). Being a graphic designer, David also decided to create a Rocky Horror-style font, called "Double Feature". Another major RHPS project started in December 2005, when he asked Sal Piro, RHPS Official Fan Club President, if he could start updating www.RockyHorror.com, which had not seen any big changes since its launch around 1995. Sal allowed him to redesign the entire site (you're looking at it! ), for which he was webmaster. He eventually became Fan Club Vice President in September 2010. He constantly worked on ways to improve the site, so that he could do his part to help keep the RHPS phenomenon going. "If I can help, so that Rocky Horror can change even one person's life the way it changed mine, then I'm doing my job." David loves visiting different shows. He attended the '96 Albany Con, as well as visited RHPS shows in New York City, Cambridge, MA, Allentown, PA, Bayville, NJ, Mt. Ephraim, NJ, Woodbridge, NJ, Boonton, NJ, and Montclair, NJ, and even got to see The Rocky Horror Show on Broadway. He has also performed at special shows like RHPS at Hofstra University, Shock Treatment in Paramus, NJ, and Clue in Teaneck, NJ. 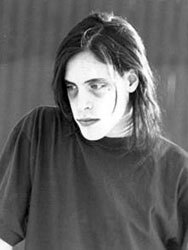 Eventually, he moved to Poughkeepsie, NY, where he became involved with Apoca-Lips, a once-a-year Halloween cast at a local college. He's played Frank for most of these showings. David enjoys many other things besides RHPS (believe it or not): He does audio mixing and mastering in an electronic music group entitled Zen Debris, he loves comedy like the Kids In The Hall, movies like Eternal Sunshine of the Spotless Mind, 80's films and music, and generally spends his time doing various dorky projects (audio and video editing, web and graphic design) for fun. After 18 years of involvement, David retired from Rocky Horror in March 2013.